300 people to make a commitment to 300 Voices .... Water For All Season. This will be a commitment of $20/month. Water For Christmas (WFC) will stay open all year. We get 300 people to commit to $20 a month for 2009 and that's an additional $72,000. As always, 100% of your money goes to charity: water. They use 100& to drill fresh wells and clean water solutions. But beyond that, the idea is to keep water on our hearts and minds of a 300-person team. So we will give all year. We pray, we dream, we plan. And then in November 2009 we kick off Water For Christmas with a team of 300 that have been serving all year. water4christmas.com is being developed and will be ready to launch later in the year. For now, go HERE to sign up. Give us your name and location. We'll start a list of people around the country who are committing to Water. You can do your donations for $5/week, or $20/month, or $240 donation for the whole year. We will not bombard you with emails ... but if you want monthly or weekly reminders to donate we will do that. 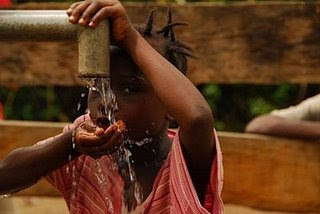 If you don't do online giving, and would like to mail in checks, you can still do that by making checks payable to Charity Global with Water For Christmas in the memo line. Please mail checks to: Charity Global - 150 Varick St. 5th Floor, New York, NY 10013. We will even send you a set of 12 envelopes if you would prefer to send a monthly donation by mail. We will have a counter showing how close we are to getting 300 people. There is a new blog badge for 300 Voices ... use it if you want. Anyone can join. At this point, all it means is a $20/month commitment. The giving is just to force us to put action behind our causes. And provide clean water for thousands in the process. Ideally, in November 2009, we have people whose treasure has followed their heart and they are ready to go. 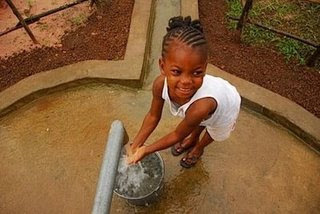 We reach 300 times more people with awareness about clean water. And clean water will erupt from the dirt of Africa's floor. We will be one voice ... 300 strong ... for clean water ... for life. For more info, updates and inspiration ... visit Jody's blog HERE. It looks like Jody may even be able to give us updates personally ... from the ground in Liberia. So we can see how our money is changing and saving lives. Let's keep it fresh in our hearts and minds. Even if it's only $20 a month.